When I calculate the value in red, I get $52429.39 instead, which is a pretty noticeable difference. Did they mean annuity due instead of immediate (a dot dot instead of just a)? I tried that, but I still get a different answer. 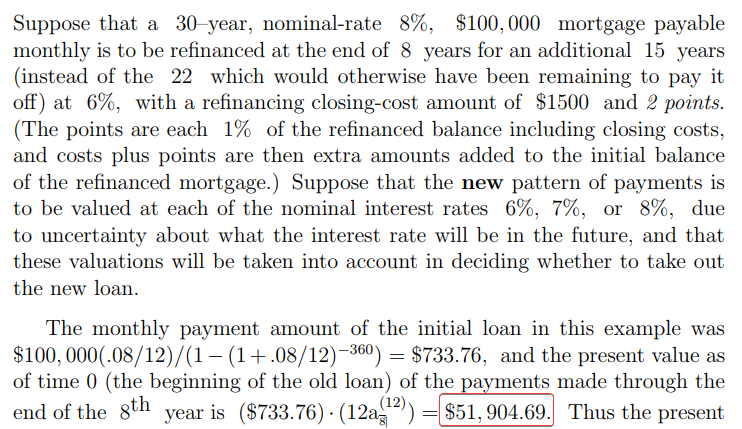 Were they using a different interest rate? I don't understand. What's the correct answer here, and how do you get it? I don't understand how he's calculating the annuity value. It doesn't seem to follow from the formula. Last edited by JohnTravolski; 11-11-2018 at 11:35 AM.. I have attached my calculations. Am I doing this incorrectly? I just don't understand why my answer is 500 dollars off. Last edited by JohnTravolski; 11-11-2018 at 12:11 PM..
8% is already the nominal monthly rate. All you have to do is 8%/12 = 0.66667%. wow, okay, I see it now. Thank you so much.